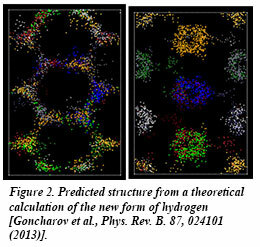 New work from a team of Carnegie scientists including Chang-sheng Zha, Zhenxian Liu, Muhtar Ahart, Reinhard Boehler, and Russell Hemley using intense infrared radiation shines new light on the fundamental material hydrogen at extreme pressures and reveals the details of a surprising new form of the solid under these conditions. 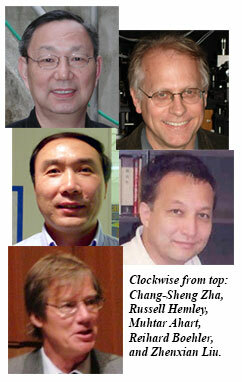 never freezes--a completely new and exotic state of matter. 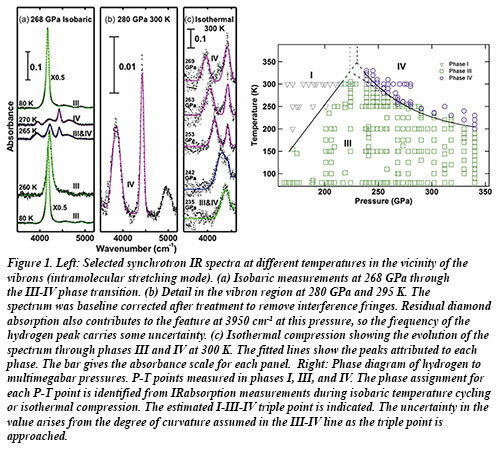 In this new paper published in Physical Review Letters, the group examined the structure, bonding and electronic properties of highly compressed hydrogen using infrared radiation produced by synchrotron radiation. Using the U2A facility at the National Synchrotron One type of molecule interacts very weakly with its neighboring molecules--unusual for molecules under this type of very high compression. The other type of molecule bonds with its neighbors, forming surprising planar sheets that comprise the structure. The measurements also show that solid hydrogen at these conditions is on the borderline between a semiconductor, like silicon, and a semimetal, like graphite. The results disprove earlier claims that hydrogen forms a dense atomic metal at these pressures and temperatures. This simple element–with only one electron and one proton–continues to surprise scientists with its richness and complexity when it subjected to high pressures. These results provide an important testing ground for fundamental theory. [Zha et al., Phys. Rev. Lett 110, 217402 (2013)].